Jogyesa Temple is the headquarter of Jogye Order of Korean Buddhism in South Korea. The Jogye Order is the major one among Korean Zen Buddhism. Being the main temple, Jogyesa Temple is the center of most Buddhist religious activities in the country. Interestingly, these religious activities are mostly well-planned and performed on grand scales. 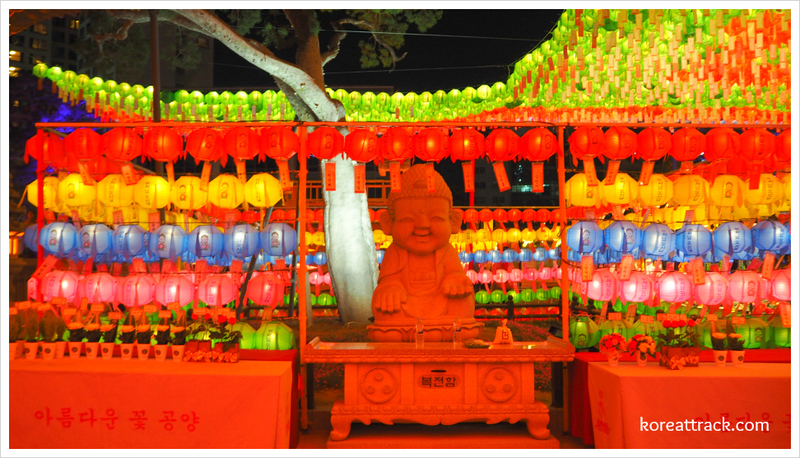 The major event of Buddhism in Korea is the celebration of Buddha’s birthday. 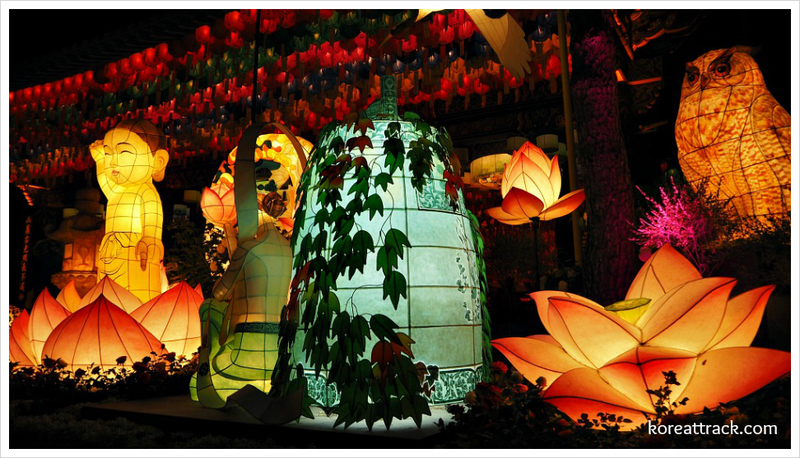 It is always celebrated with high spirits, festivities, and grand religious symbols such as the colorful lanterns. I am one among the fans of Jogyesa Temple’s visitors during this period of festivity. I have been there countless times just to witness the celebrations and enjoy the whole lively but serene atmosphere. They serve food as well! One time, I happened to visit the place unaware that it was an advent of Buddha’s birthday! It was by chance because our first intention was only to enjoy a Buddhist meal. The temple is running a restaurant serving vegetarian dishes. The restaurant is conveniently located right across of the temple. In short, we decided anyway to enjoy our Buddhist vegetarian meal first and proceed to stroll around the temple. I was with my officemates trying to break the chain of going to the same restaurants (or cafes) near our office! As always, I believe, and just like most Korean temples do, they painstakingly created and set up intricate and beautiful exhibitions of flowers, lanterns of varied colors, and more enlivening and meditative settings of decorations. For me, experiencing the whole festive scene and atmosphere could be tantamount to feeling like in ‘heaven’ or ‘nirvana.’ That is not an exaggeration for me. It might be a different experience for you - hopefully a good one! Okay, before I will explore and share further my experiences during my there, it might be good if we can talk a little bit about Jogyesa’s history. If you do not want (or need) to read this part, then just skip it and continue scrolling down to see nice photos with some descriptions. Jogyesa’s first temple was established in 1395 during the Joseon Dynasty. However, its modern temple was founded in 1910. It was by then called ‘hwanggaksa.’ Later on, hwanggaksa was changed into ‘Taegosa’ during the Japanese occupation period until 1954. Although Jogyesa has a long history, it did not become the chief temple of the Jogye Order of Korean Buddhism until 1936. By becoming so, it plays the significant roles in the Order’s present state of Seon (Zen) Buddhism in the country. Jogyesa is situated strategically in Gyeongju-dong, Jongno-gu, central Seoul. You will not miss it as it is quite visible. If you find it difficult, simply ask anybody to point the direction. So, what will you see when you get there? Here are some of the obvious special features of the temple. Main gate - It is not huge but intricately decorated with Buddhist symbols and figures on the ceiling and under the roof of the gate. I am pretty sure you can find more at this temple ground. However, take your time to move around as if you are meditating or anything like that. It would be a fulfilling feeling! Okay, here are some further descriptions of the above items. Daeungjeon (literally means “big meeting hall”) is the grandest structure in Jogyesa. It has granite slabs steps on its left-hand side and its main entrance door elevating the whole structure above the ground. Surely, this is one of the symbolism of holy places where one communes with the diving being. 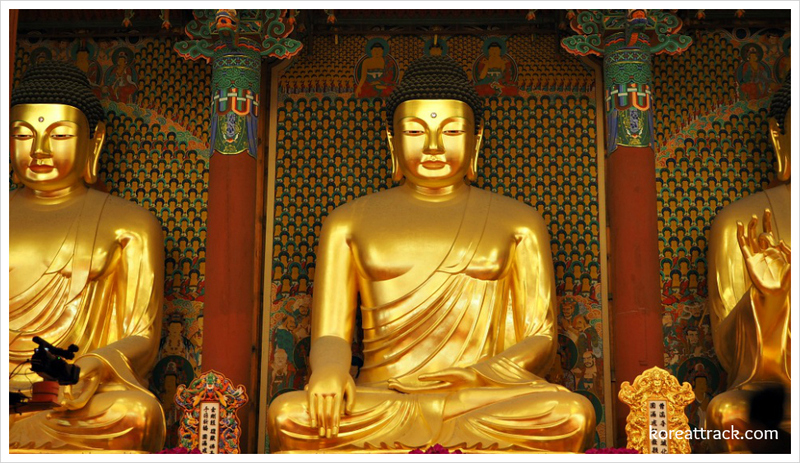 Daeungjeon houses enormous Buddha statues in sparkling golden colors. There are three of them. If you can, notice their specific facial expressions and palms’ symbolic gestures or positions. It is also the main hall where every believer offers prayers. If you are not sure how to behave inside the hall, observing others first could be a great idea. And it would be great if you learn in advance the etiquettes when inside the temple ground. Do not pass in front of the others but behind them. If it is inevitable, then do it cautiously while clasping both palms and bowing while passing through. Now, if you want to learn more about the Buddhist etiquettes while in the temple ground, please see the page and look for the Etiquettes sub-topic. You will easily spot the Daeungjeon temple building since it is the biggest one. Upon reaching the main gate of the temple ground, you will see it immediately with its grandiose sight. This building is designed in traditional Korean style and painted with traditional colors and in intricate designs. I am sure that the Korean Buddhist building designs are unique when compared with other Buddhist temples in other countries. Upon quick observation, temples in Japan and China, in particular, are quite different. Yes, I have been inside the Daeungjeon Hall and paid my respects to Buddha. I am a Catholic, but I indeed believe that every traditional religion holds some truth of the divine creator. For that reason, I recognize every religion that promotes and protect life in all its aspects. And it is the same reason that every form of belief should recognize and respect each other’s traditions that promote peace and harmony to all. Jinsinsari is a seven-story stone pagoda erected right in front of Daeungjeon Hall’s main entrance door. It is a pagoda that stores a piece of Sakyamuni Buddha’s sarira. A ‘sarira’ is a Buddhist relic, and it usually refers to the pearl or crystal-like object that can be found after cremating a Buddhist master’s remain. It is said that the sarira was given by Zen Master Dharmapala of Sri Lank in 1913 to the Buddhist head monk of Jogyesa Temple that time. Due to Jinsinsari’s religious significance to the Buddhist believers, visitors and regular faithful would pray not only inside the temple but also in front of this pagoda. They pray there knowing that it holds a holy relic of their spiritual master and so their supplications can be answered properly and promptly. This is an old pine tree located right beside Daeungjeon as you enter from the main gate. Actually, it is that old. They counted it is about 500 years old. It looks small but still growing strong. Some say it came from China brought by a Buddhist monk. This particular pine tree genus does not grow easily in Korea. That is the wonder. Or you can say that is the mysterious aspect of this tree. So, don’t miss it! Jogyesa is one of those temples that offer an opportunity to visitors (locals and foreigners) to experience a bit of a monk’s monastic life. A Temple Stay Programme is being offered by many temples representing temples located in various provinces of the peninsula. Lantern-making and other interesting activities. As a participant, you can speak with Buddhist monks and participate in their temple rituals. Please, see more on the Temple Stay Programme on that page. Certainly, you will also enjoy their vegetarian and healthy Buddhist monk’s food while undergoing their program. If you do not have that luxury in participating in the programme, you can find their facility right across where Jogyesa Temple (조계사) is located. I have been there, and I really love it! Their food is not the usual Korean food being sold in most Korean restaurants. They are mostly organic, and they do not use taste enhancers (like the sodium glutamate or Ajinomoto). So, I would go for a monk’s meal because it is healthier! Now, if you are thinking about including this in your bucket list, make sure that you have it recorded in your note or mobile phone app. Also, it would be more convenient if you booked your hotel nearby - in the Jongno area, Seoul. Thanks for visiting this website. Please, share this link with your friends or family if you find this useful.